Living in Arizona the air quality is not great. But I can't blame it all on Arizona since there are many places with low quality of air. But for me and my family its more then just annoying to have bad air quality. I have asthma and allergies, Jayden has allergies, and I'm pretty sure Evan does to. John has begun to develop some allergies also. So on those high air pollution days its not fun to go outside. But inside is not much better. You can't keep all the outside air out. The Luma Comfort air purifiers eliminate common airborne pollutants like dust, pollen, chemicals, gas, and bacteria and provide a healthier home environment. 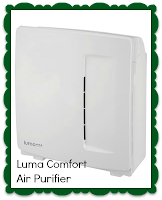 The Luma Comfort AP170W Air Purifier has a sleek, innovative design that is able to capture over 99% of common airborne pollutants in rooms up to 170 square feet. It is great for a bedroom or small office. It has an advanced 5-stage filtration system that includes a carbon pre-filter, HEPA filter, VOC filter, Ti02 filter and UV light. It is easy to operate and virtually effortless to maintain. The filters snap right in. It has a SmartClean indicator that will let you know when the filer needs to be replaced. I am excited to use this in our home and hopefully help my family breath a little easier. I am hoping this will also eliminate or limit the number so sicknesses my family will endure during the next few months and longer. I have always wanted to have an air purifier in our home. This would make a great gift for just about anyone. Everyone wants to be able to breath clean air. Or getting one for yourself so you can have clean air for all the holiday parts is a great idea too. I will have mine set up for our Christmas celebration. I might take it with me to my moms for Thanksgiving since she lives out in the middle of no where with tons of dust blowing around. Luma Comfort carries many other great products like misting fans, evaporate coolers, ice makers, and humidifiers. Jayden just broke his humidifier.. I might have to check in to the one at Luma Comfort. Thanks for sharing this post.it such a nice Air purifier product .i am happy to buy this. I learned it can cover a room that is 170 square feet. I also like the ice makers. I really like the Misting Fans! That would be perfect for my mother inlaw's pool. I like the IMPC-2800S Ice Maker. We could really use one! This purifier seems to be the best option for residential use. Thanks for explaining the in detail. Few months back i purchased a air purifier. This one is the best air purifier in India. I learned that their evaporative coolers can lower indoor temps by 30 degrees. I learned that the evaporative coolers can lower indoor temps by 30 degrees. The air in my home gets very dry during the winter seasons. I love the style of the Luma Comfort HC12W ultrasonic cool mist humidifier. Would be perfect for my home. I learned that the Luma can cover a room up to 170 square feet. The EC45S evaporative cooler is really awesome. I think we need one in our house. Thanks! I really need an Ice Maker! I would love to try one of their humidifiers for the winter months! I learned it can cover a room that is 170 square feet~that is awesome! I like the Cool & Warm Mist Humidifier. I like the Luma Comfort HCW10B Cool/Warm Mist humidifier. i like the EC45S Tower Evaporative Cooler . i learned that the Luma Comfort AP400W is your choice for serious contaminant removal. This air purifier covers 400 square feet and removes particulates as well as chemicals and VOCs. The Luma Comfort HCW10B humidifier.